Acupuncture is an integral part of China’s current and past health care system. It has been used to treat many different conditions for over 2,500 years! Within Chinese medicine, disease comes from the blockage or incorrect movement of the body’s energy, or Qi. 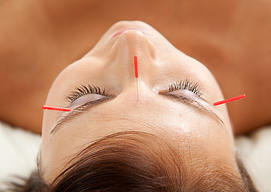 Acupuncture is used to correct these abnormal flow patterns. Many people feel relief after the first session and continually do in subsequent sessions. The conditions treated are vast, but in western society acupuncture has been mainly used to treat pain, migraines, anxiety, and infertility. Studies have shown acupuncture to be as effective at relieve chronic pain as opioid pain killer medication, when done on a consistent basis. It can also be used to rejuvante your skin. Minizing the look of fine lines and wrinkles by inducing the growth and repair of the collagen that is lost as we age.